This dip is a total breeze to throw together! No cans needed! Simply grab a bag of dried beans and get ready for a party-perfect vegetarian dip that's easy, make-ahead, and SO delicious! Rinse your black beans and toss them in your Instant Pot. Dice and chop your veggies and mince your garlic. Add veggies, garlic, tomatoes, broth, oil, lime juice, and spices to the pot and mix. Press the bean button and cook for 30 minutes high pressure. Allow a natural release (NR) for 10 minutes then quick release (QR) remaining pressure. Use an immersion blender (or a blender or food processor) to blend the tip into creamy deliciousness and once cooled slightly, give it a taste. You can adjust the spiciness by adding anything from hot sauce, spicy salsa, red pepper flakes, or cayenne to the mix and add any extra spices/salt to suit your tastes. As written, it's on the mild side. Serve piled high with all your favorite toppings and dig in! 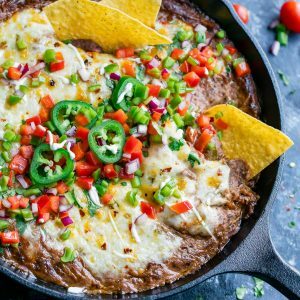 Craving an easy cheesy baked black bean dip? Fabulous! Preheat your oven to 350 degrees F. Add cream cheese to your bean dip before blending (if you forget you can still do this after the fact, no biggie) then pour into a lightly greased cast iron skillet and top with grated cheese. Bake until hot and bubbly, approx. 15 minutes. For an extra cheesy dip, feel free to add 8 oz cream cheese and extra cheese on top. My husband and I can't resist doing this from time to time - it's a total indulgence and great for a game day spread! Recipe yields approx. 6 cups of dip. Portioned into 1/4 cup servings, yields 24 servings. Easily feeds a large crowd and leftovers are fantastic the next day. Have some dip left over? Try it as a base for tacos or quesadillas topped with cheese, salsa, and veggies. SO GOOD! No avocado oil? No problem! Use your favorite healthy oil and you're good to go!